Welcome to Bharatpur - contd. A rich collection of artefacts, exquisitely carved sculptures and ancient inscriptions can be admired in the Government Museum located in the Palaces. All these items speak volumes about the rich heritage, art and crafts of the region. 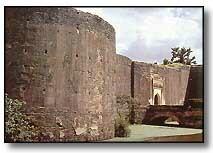 A few of the eight imposing towers still stand erect within the glorious ramparts of the Fort. Especially two of them - Jawahar Burj and Fateh Burj are of special interest. These were built by Maharaja Suraj Mal to commemorate his victories over the Mughals and British respectively. The coronation ceremony of the Jat rulers of Bharatpur was also help at the Jawahar Burj. Once the royal hunting preserve of the princes of Bharatpur, it is one of the finest bird sanctuaries in the world inundated with over 400 species of water birds. Exotic migratory birds from Afghanistan, central .Asia, Tibet as well as Siberian cranes from the arctic, greyleg geese from Siberia and bareheaded geese from China , come here in July/Aug to spend the winters in warmer climate and they breed till Oct/Nov. Colonies of cormorants, spoonbills , storks, egrets, herons, pelicans, ebis and grey herons can be spotted all over the park. The raised paths camouflaged by babul trees make their viewing easier. Deeg(32 km): Once the summer resort of the rulers of Bharatpur, it served as the second capital of the region. This interesting town is strewn with massive fortifications , stunningly beautiful gardens, magnificent palaces and a colourful bazaar. Air : Agra 56 km is the nearest airport. Road : A network of bus services links bharatprur with several cities within and outside the State. Clubs: Bharatpur Club, Company Bagh. Tourist Information Centre: Tourist Reception Centre, (RTDC), Hotel Saras, Agra Road, Tel. 22542. Guide Services: Approved Guides for the National Park can be hired from the Tourist Reception Centre, RTDC Hotel Saras, Tel. 22542 and Dy. Chief Wildlife Warden, Forest Rest House, Tel. 22777. Mini Bus Tour: Mini bus is operated by Forest Department. Please contact the Dy. Chief Wildlife Warden, Forest Rest House, Tel. 22777.